Distribution: South coast of New South Wales to Cape York in far north Queensland extending beyond the inland ranges for a distance of up to 500 km. Usually found in sandy or sandstone-derived soils but sometimes found in basalt soil or rocks, often in moist depressions or along watercourses. Also found on Lord Howe Island. Derivation of Name: Leptospermum...from Greek leptos, thin and sperma, a seed, a reference to the small seeds. polygalifolium...from Latin folius, a leaf; ie. with leaves resembling the genus Polygala. Leptospermum is a genus of about 83 species, all but three occurring in Australia. 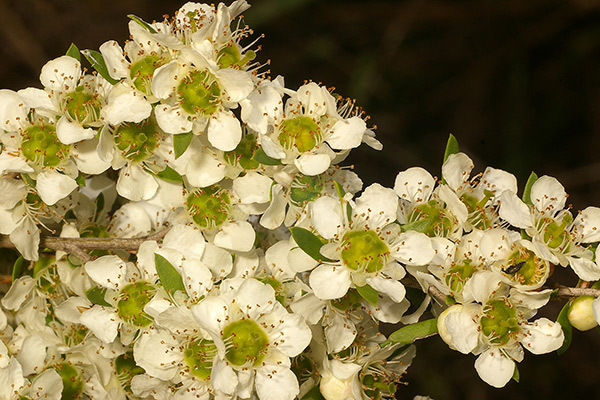 The type specimen for Leptospermum polygalifolium was collected at Port Jackson in 1796. L.polygalifolium was known for many years as L.flavescens. Leptospermum polygalifolium is a shrub, often 0.5 to 3 metres in height , or a slender to stout trunked tree to 7 metres or more, the bark usually being close and firm but soft, thick and flaky in some forms. The young stems, at first, have a close pubescence but usually become glabrous, with a conspicuous flange near the node and spreading and tending to curve around the stem. Leaves are sometimes aromatic, but not strongly, and are usually from 5 mm to 20 mm long, oblanceolate-elliptical to narrowly linear-elliptical, flat or with the margins recurved, the tip often recurved with a soft or sharp point or, occasionally, a short pungent point. Flowers are usually white but may be greenish, off-white to pale pink and are usually 10 to 15 mm in diameter, occurring singly on modified shoots on the ends of very short or long branches, often in adjacent axils and on adjacent branches with new growth extending, mostly from branch ends, during or after flowering. subsp polygalifolium - Leaves usually glabrous, 2 - 3- mm wide. Its natural habitat is the central south coast of New South Wales . A small to medium shrub to 1 - 3 metres high by 1 - 3 metres wide. subsp montanum - Leaves usually glabrous, 2 - 3 mm wide. Found mainly in mountain habitats in the north-east of New South Wales. A generally rounded shrub to 1. 5 - 3 metres high. New growth is silky-hairy and may be bronze coloured. subsp cismontanum - Leaves usually obtuse , 8 - 10 mm long and usually a dull grey- green colour. Usually found in sandy and peaty coastal swamps in coastal areas in dry sclerophyll forest in north-east New South Wales and south-east Queensland . A medium shrub to 2 metres high and 2 metres wide but occasionally reaching 4 metres high. subsp howense - Leaves usually flat and rather stiff in texture with the lower side not conspicuously different in colour, leaf apex usually acute . Grows on basalt cliffs and ledges and mountain summits on Lord Howe Island . A rounded shrub to 2 metres high by 2 metres wide but occasionally up to 6 metres in height. subsp tropicum - Leaves narrow, 5 - 20 mm long by 1 - 1.5 mm wide. Found in wet coastal heaths, on dunes and open woodland on sandy soils in central and north- east to north Queensland. A small to medium shrub to an erect shrub to 4 metres high by 2 metres wide. subsp transmontanum - Leaves usually more than 1.5 mm wide and 10 - 15 mm long. . Grows in dry sandy alluvial soils and rocky areas along watercourses in dry sclerophyll forests on the western side of the Great Dividing Range in central and southern Queensland and in northern and central New South Wales. This is a complex group with widespread intergradation between the various forms. It is possible that further revision of the species will occur in the future. Leptospermum polygalifolium has been used as garden plant for many years, both as a specimen planting and in conjunction with other plants in group plantings. It is hardy and can be relied on to produce a good display of flowers each year. It is sometimes grown as a hedge plant but, in this situation it prefers light pruning as it sometimes does not respond well to heavy pruning. It is generally long-lived but can become a bit straggly with age as some of the lower branches are shed. A tall erect form from the Windsor Tableland in north Queensland which has cupped flowers but, at this stage, is not widely grown in gardens. The form known as L. 'Cardwell' originates, as the name suggests, in the Cardwell area of north Queensland. This plant has pendulous branches and will grow to a height of 1.5 - 2 metres with similar spread. It produces a profusion of white flowers in late spring and early summer. L. 'Pacific Beauty' was selected from a natural population growing on the seaward side of Hinchinbrook Island, off the coast of north Queensland. It grows to a height of about 1.5 metres with a spread of about 2.5 metres . Pink buds open to white flowers about 20 mm in diameter. L.polygalifolium has been used in hybriisation work and is one of the parents of the cultivars 'Outreagous' and 'Tickled Pink'. It is also thought that the popular cultivar L. 'Pink Cascade' is a natural hybrid of L.polygalifolium and L.continentale. It exhibits similar habits to L. 'Pacific Beauty' but the young growth is red and the flowers are pink to about 15 mm in diameter. All forms of L.polygalifolium can be propagated easily from seed or from cuttings of medium hard wood which will strike fairly easily. Named cultivars such as 'Pacific Beauty' should only be propagated from cuttings as seedlings may vary significantly from the parent plants.